With twinkly lights festooning the avenues, elaborately fanciful window displays, and heavenly smelling Christmas tree vendors on every other corner, it’s easy to get into the holiday spirit in New York City. At Purl Soho, too, we are bustling with energy and good cheer! And we can’t think of a better way to kick off this very special season than with some totally simple, bright and blithe holiday ornaments! 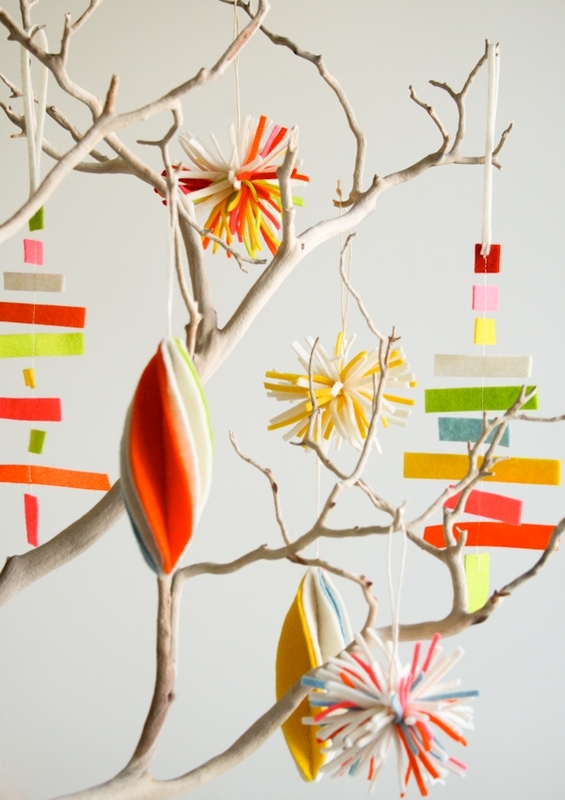 Since they don’t serve any practical purpose, ornaments get to be a pure expression of creativity. 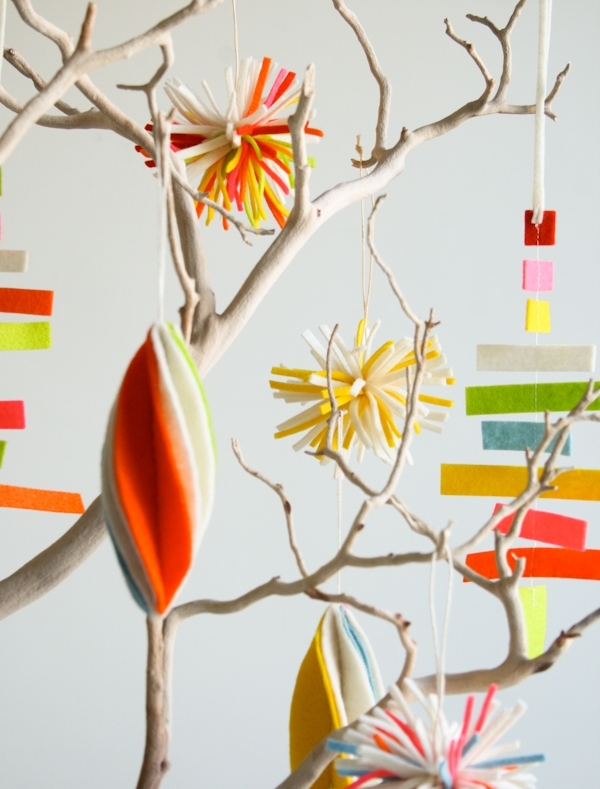 They just have to be fun and whimsical, and this trio of felt baubles certainly fits the bill. We used our vibrant new Confetti Bundle of 100% wool felt, so while they may only take minutes to sew, these Felt Holiday Ornaments will be treasured favorites year after year! 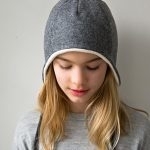 Molly’s Petal Drops are an elegant update of last year’s Felt Snow Balls. This year’s version is reminiscent of beautiful vintage blown glass ornaments. 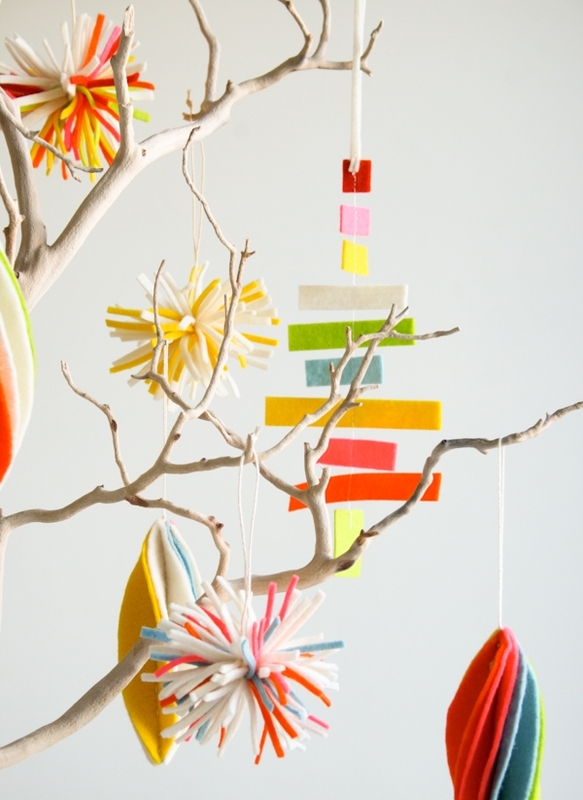 We love how they twist and swirl on the tree! A Petal Drop Ornament template, available for free download here, printed and cut out. These ornaments are an update of my previous Snow Ball Ornaments. You might want to check out that story for more photos of sewing the ornament together. These ornaments are made in two different sizes: small (3 3/4-inches tall) and large (6-inches tall) but they are put together in the same manner. The only real difference is in the cutting. Keep in mind that each ornament consists of 6 petal pieces. 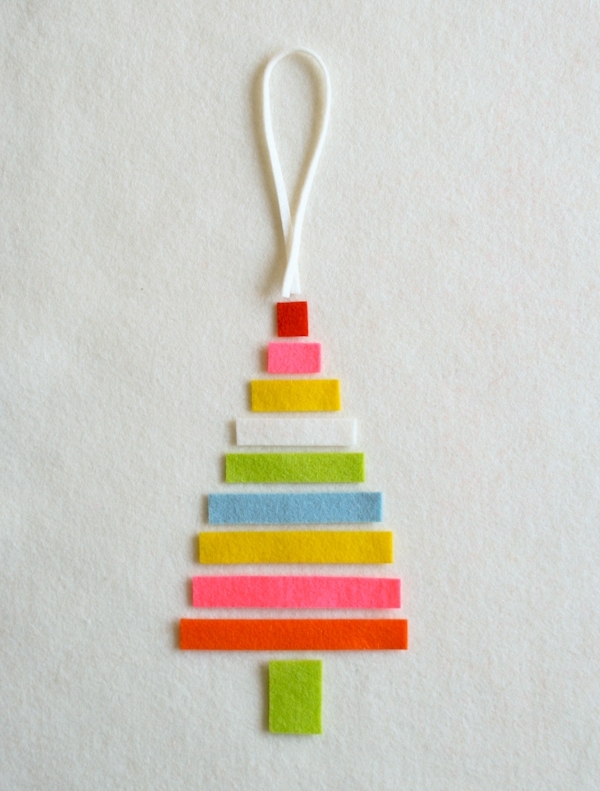 For the small ornament: Cut at least three 2-inch wide strips along the 8-inch width of the felt pieces. You can get two petal pieces per each cut strip. 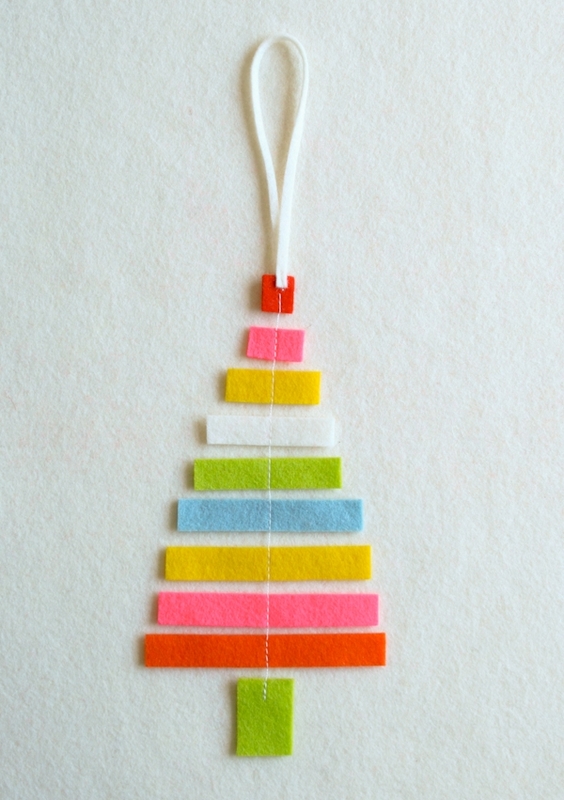 So if you want to make an ornament that is all one color you’ll need to cut 3 strips. 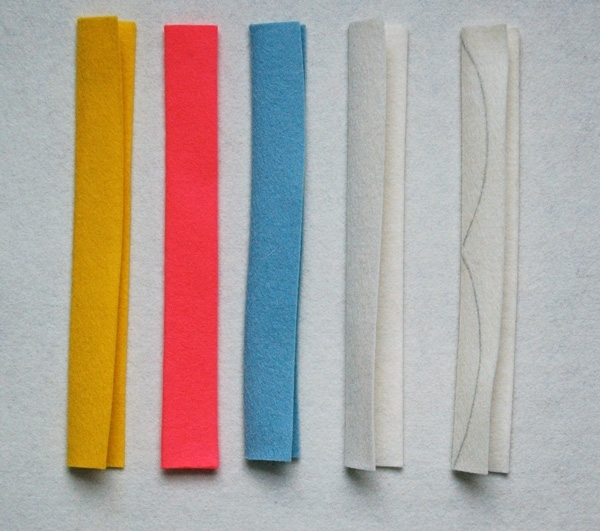 In the example I wanted three ecru petals and one petal each of yellow, pink, and blue so I cut five total strips. For the large ornament: Cut six 2 1/2-inch wide strips along the 8-inch width of the felt pieces. You only get one large petal piece per strip. 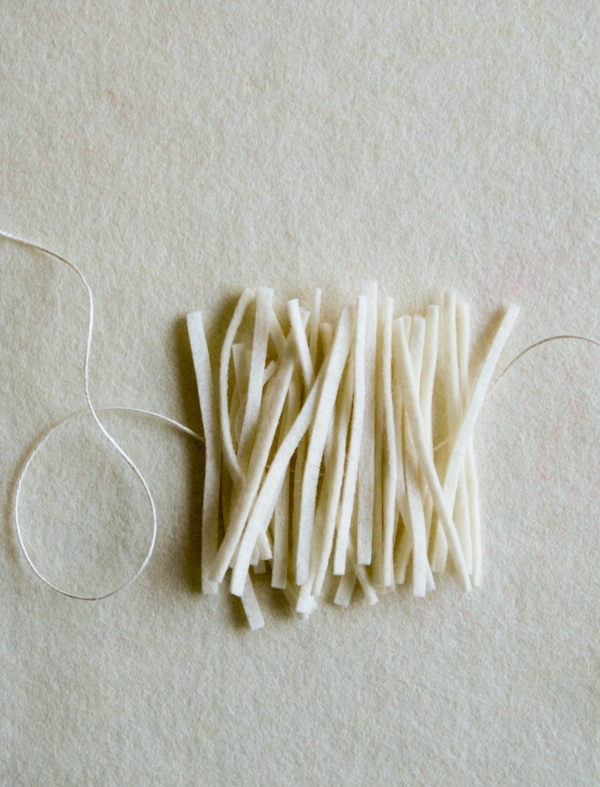 Press each of the cut strips in half lengthwise. Trace the template along the fold. 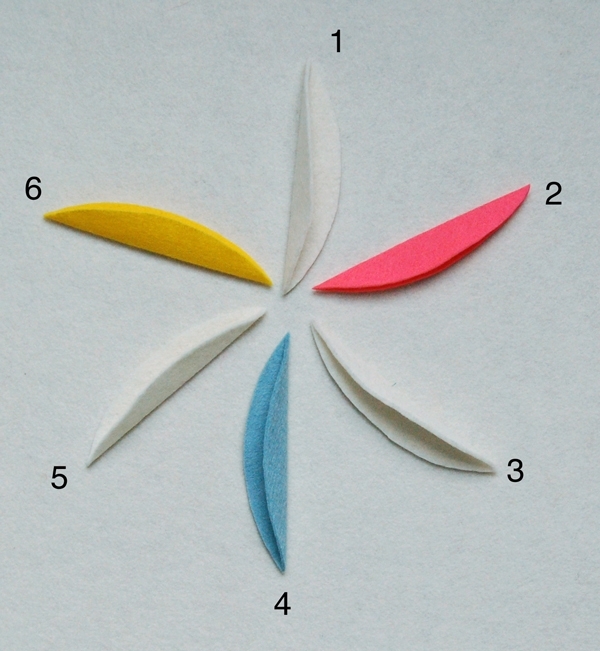 Remember, you can get two small petal pieces from each strip. Cut the petal pieces out. Make sure you have 6 total. Arrange them in a pleasing order and assign them numbers as shown above. Hold piece 1 and 4 with their outer folded sides together so the fold creases match up. With a small running stitch sew the two pieces together along the inside of the creases. Do not cut the thread at the end of this seam. Fold the two sewn pieces closed along their creases and place pieces 2 and 5 opposite to one another sandwiched over these folded pieces with their center creases lining up with the center channel. Sew pieces 2 and 4 together through the center channel trying not to catch pieces 1 and 4 as you go. Do not cut your thread. Fold pieces 2 and 5 closed and then sandwich pieces 3 and 6 over the previously sewn pieces as shown above. 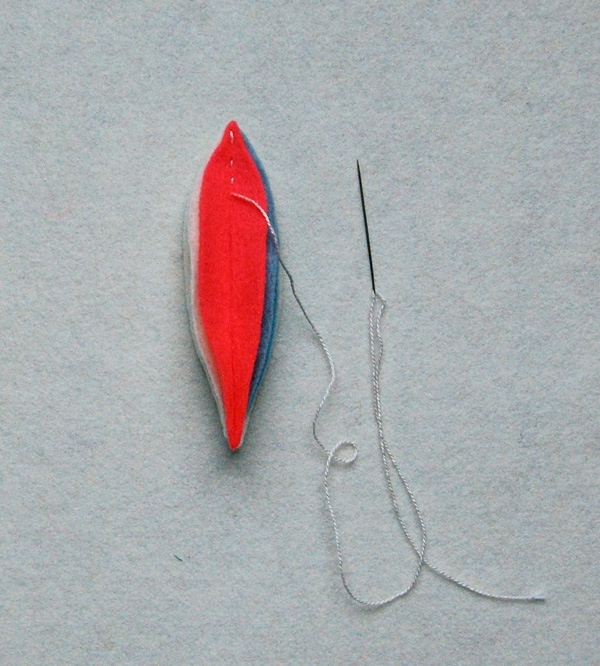 Sew pieces 3 and 6 together along their center creases. When you are done with this seam pull the thread out at the very top of the ornament. Create a 3-inch loop at the top of the ornament and tie an overhand knot secure it. Pull the needle through the center channel of the ornament and out at the bottom of the ornament then snip it off to hide the end. 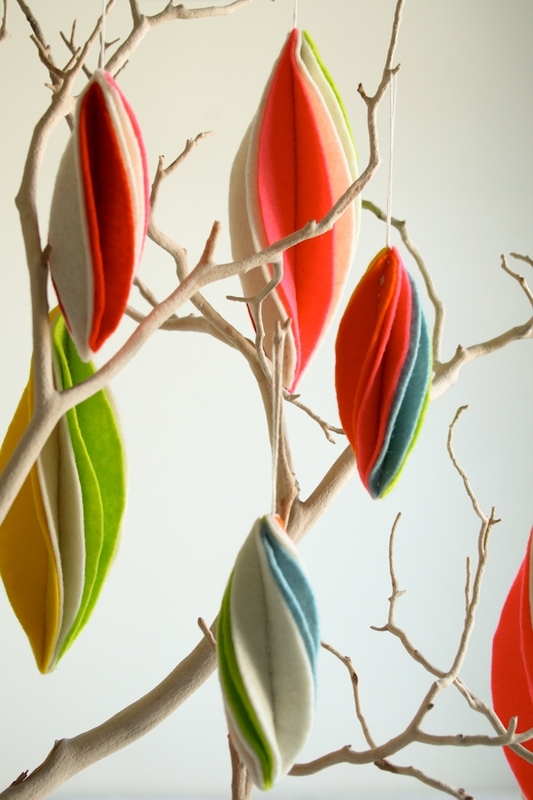 Page’s Twirling Trees are modern, clever, and chic. They take absolutely no time at all to snip and sew, but they finish with a polished and completely unique look! 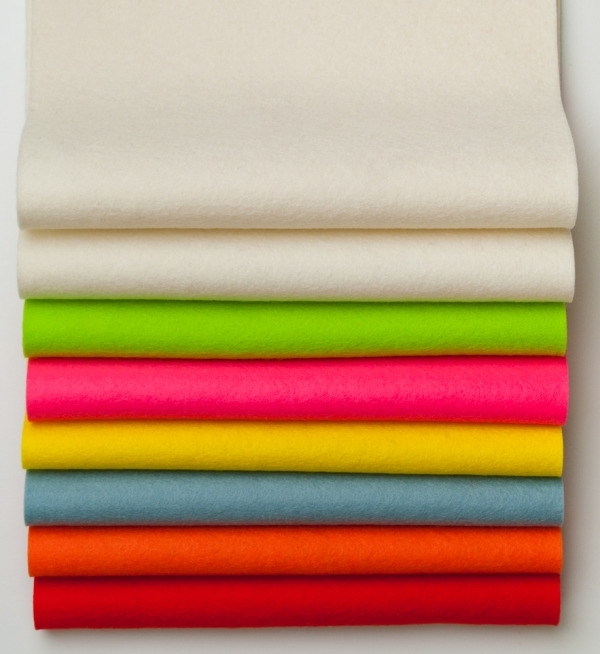 Using a rotary cutter, non-slip ruler and cutting mat, cut 1/2-inch wide and 1-inch wide strips of each color of felt. Cut fewer 1-inch strips since these are only for the trunks. 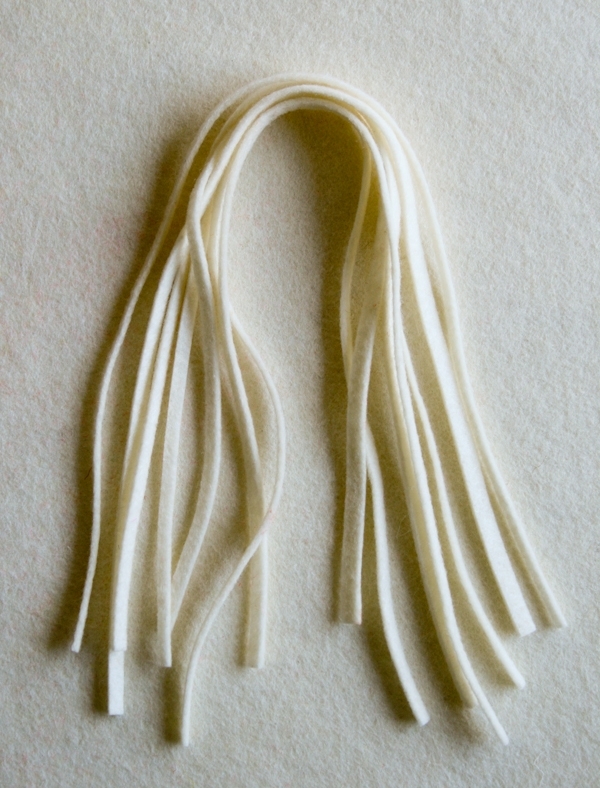 From the ecru felt cut cut thin strips (a bit wider than 1/8-inch) for the hanging loops. From the 1/2-inch wide strips cut the following lengths in each color: 3 1/4-inch, 3-inch, 2 3/4-inch, 2 1/2-inch, 2-inch, 1 3/4-inch, 1 1/4-inch, 3/4-inch and 1/2-inch. From the 1-inch strips cut 3/4-inch pieces (this piece will be turned vertically for the trunk). Arrange pieces as shown above starting with hanging loop and then shortest to longest strips as you go down. End at the bottom with the trunk piece which should be turned vertically. 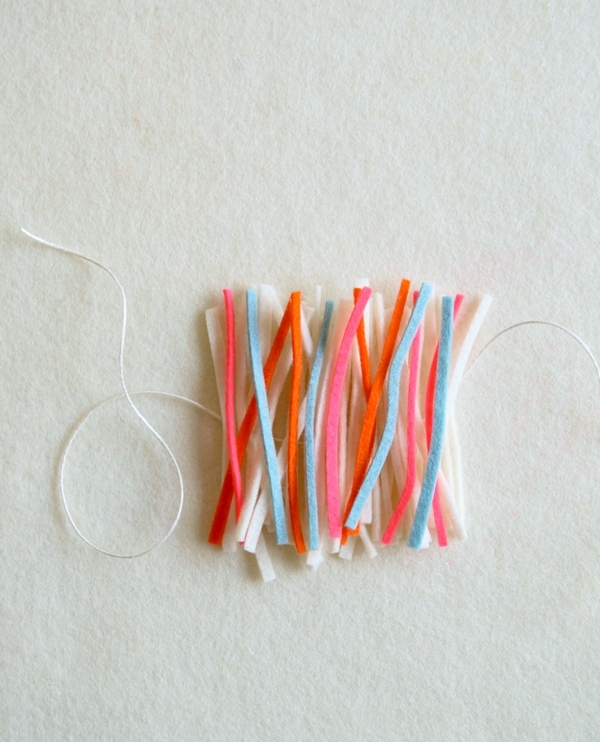 Using a sewing machine, chain piece the strips together leaving approximately 1/8-inch to 2/8-inch between each strip. Sew hanging loop to top piece either before or after chain piecing everything together. 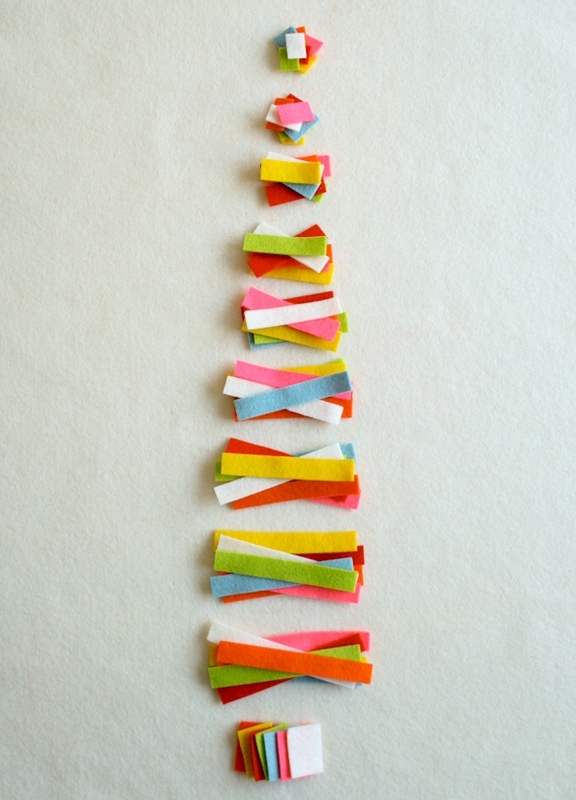 Page’s Confetti Bursts are the simplest and most cheerful of all. 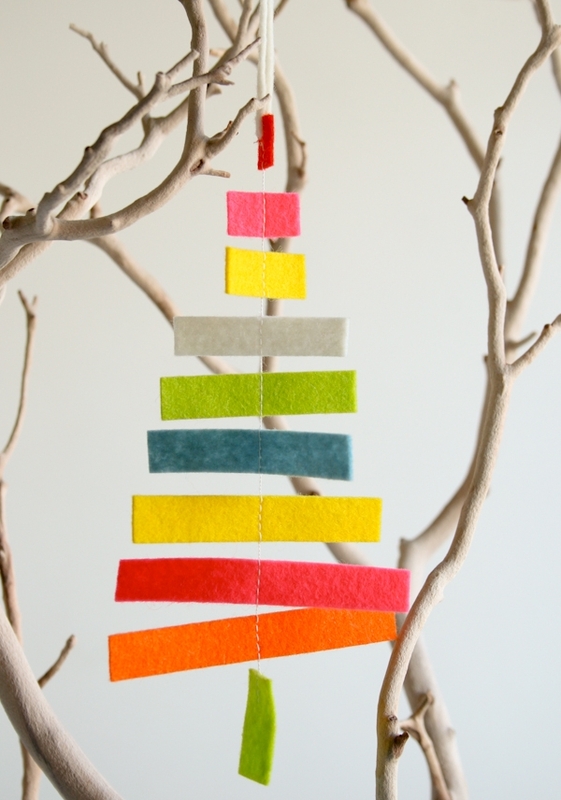 They take zero sewing and add tons of pizzazz to the tree! 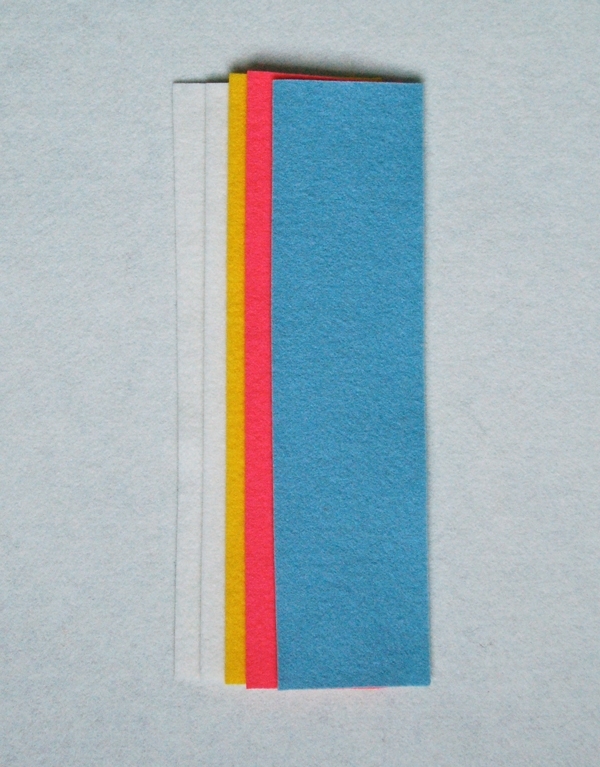 Using a rotary cutter, non-slip ruler and cutting mat, cut strips 3-inches by 1/8-inch of all felt colors. 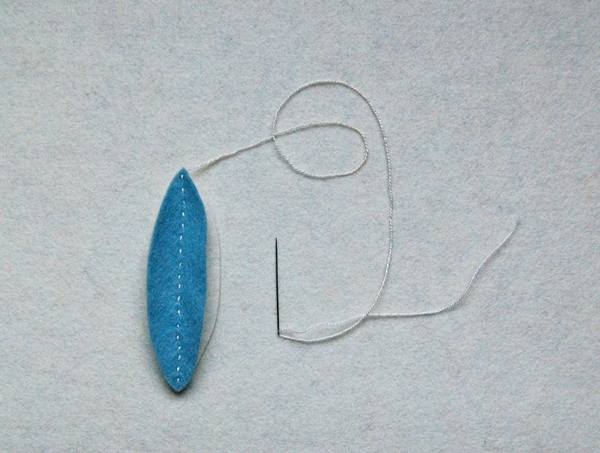 Cut a piece of Londonderry linen approximately 8-inches long. 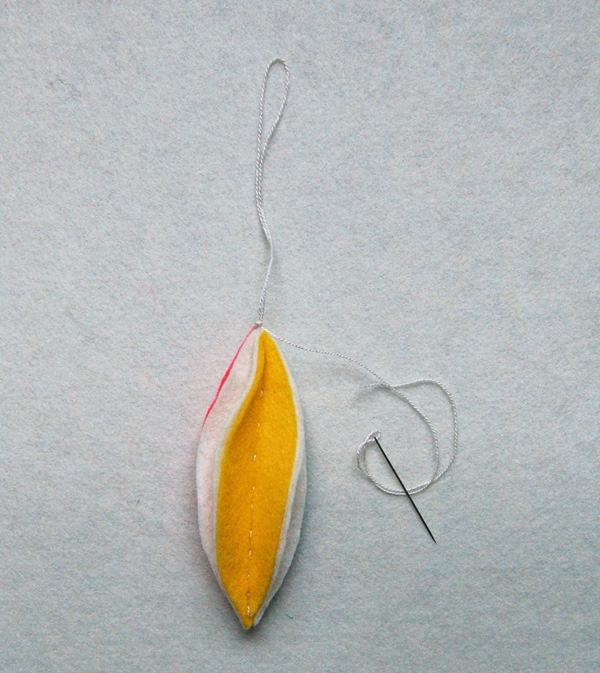 Place ecru strips of felt on top of thread. You can choose any color combination you’d like. We chose to make ours with mostly ecru and added just hints of the other colors. 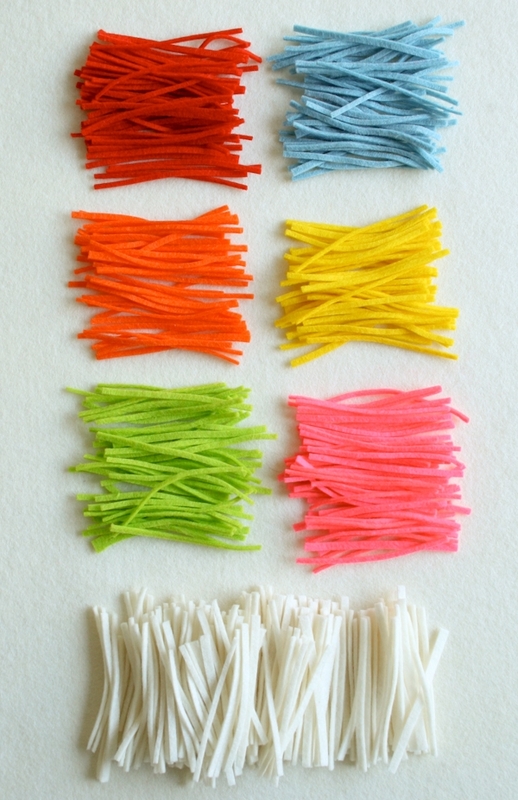 Place colored strips of felt on top of ecru strips. 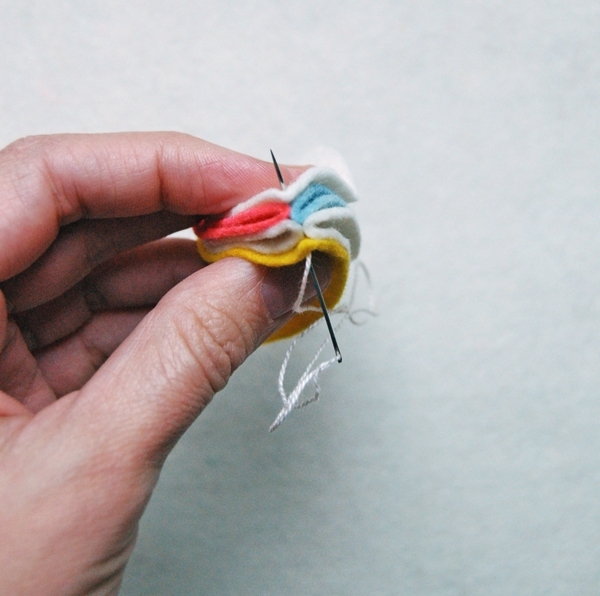 Pull linen extremely tight around strips of felt and tie in a knot without letting it loosen. Hint: Ask someone to lend a finger to help keep it as tight as possible while you secure the knot. 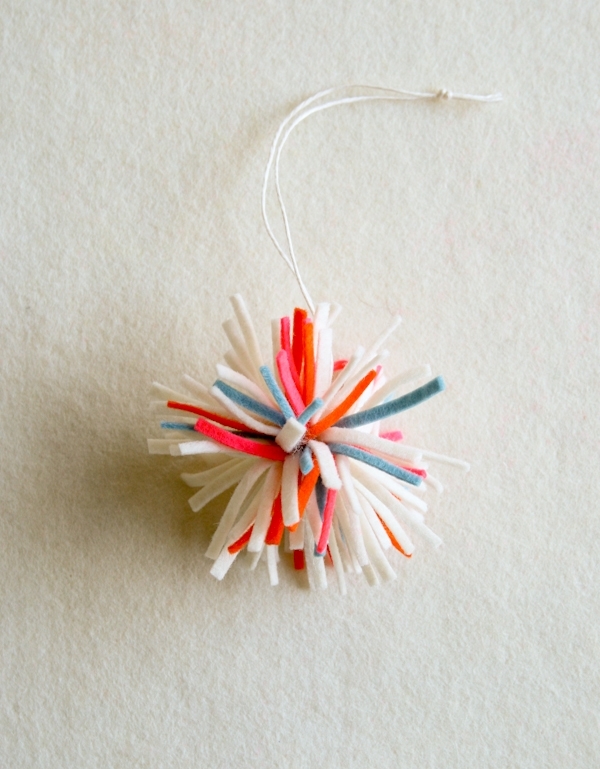 Fluff strips of felt to create pom pom shape and voila! 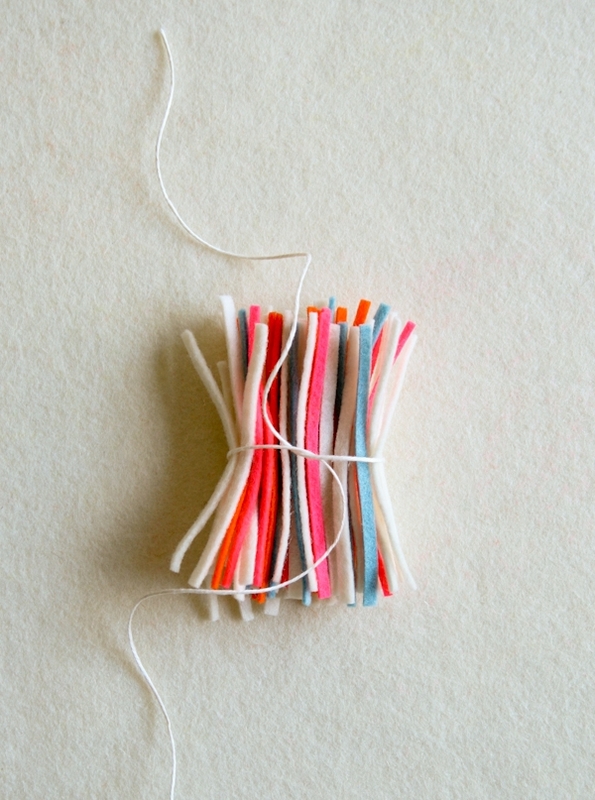 Tie two ends of linen together in a knot to create a loop for hanging. Such wonderful ideas and so simple to make. I will definitely make some of these. 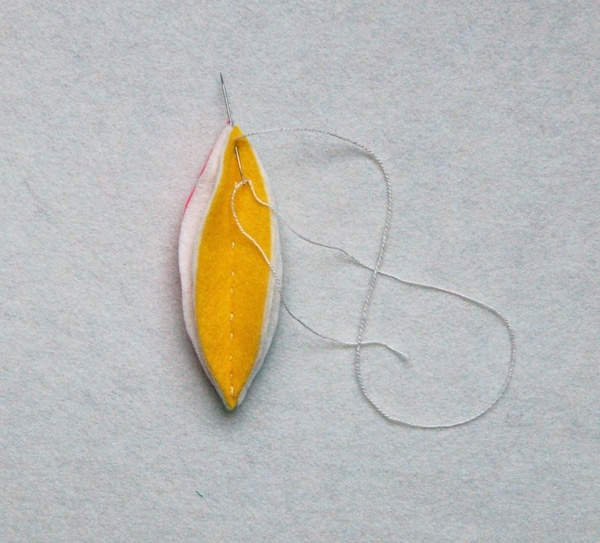 I made two of the petal drops after dinner last night and plan to make a whole flock. Lovely! 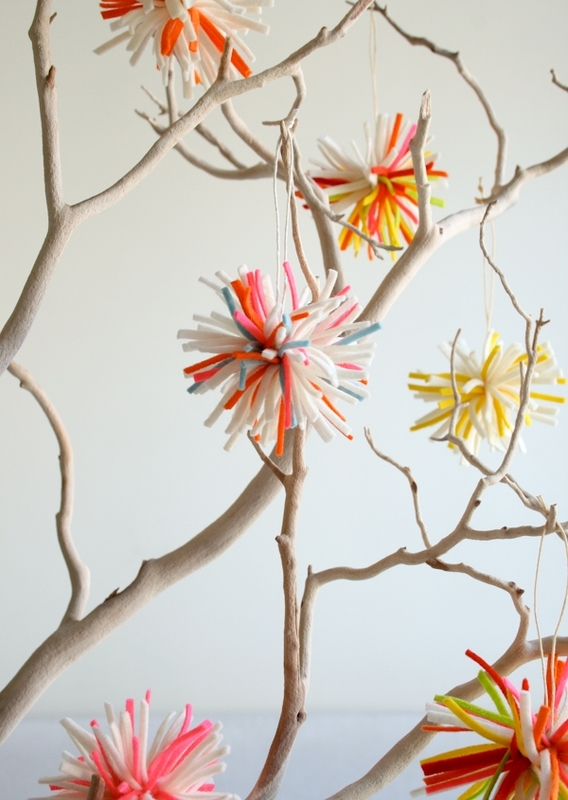 Also great for a toddler-friendly Christmas tree. I put a Link to your site. 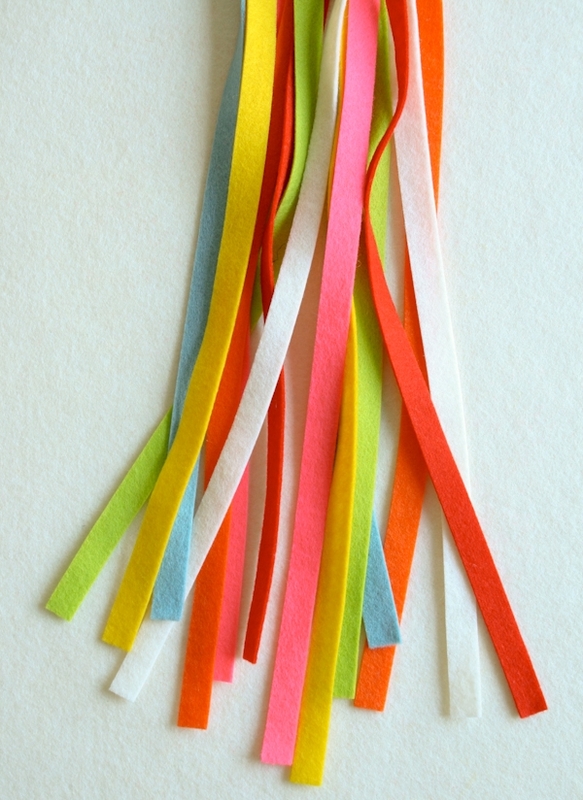 For the Confetti Bursts , what length did you cut the 1/8 inch felt strips ? They should be 3-inches long. Thanks for pointing out the oversight, the information has been added to the pattern now. How many ornaments does each pattern make? What about the twist in the petal drop ornaments? Is that somehow sewn in or do you just twist it? If it is just twisted manually, does it stay twisted? They twist pretty naturally on their own. You can finger press them to be straight or twisted once you're done. The wool is very maleable and it will stay in whatever arrangement you decide on. I love these! But I'm confused about the tree. How do you sew them with a sewing machine? Is there tissue underneath that you pull away??? I would love to made thise and I would probably add a dusting of glitter too! these ornaments are just perct! i love the material and above all the colors! You just sew with nothing in the machine for a few stitches. no tissue paper needed. Your glitter idea sounds beautiful! Thanks for writing in! Simple and genius !! Love it !! I love all of these! fantastic colour choice. I love all these! I have toddlers at home and have been looking for something like this! If I want to make all 3 types of ornaments, how many bundles of felt would I need to get? Thanks!!! You can make all three with just one bundle!